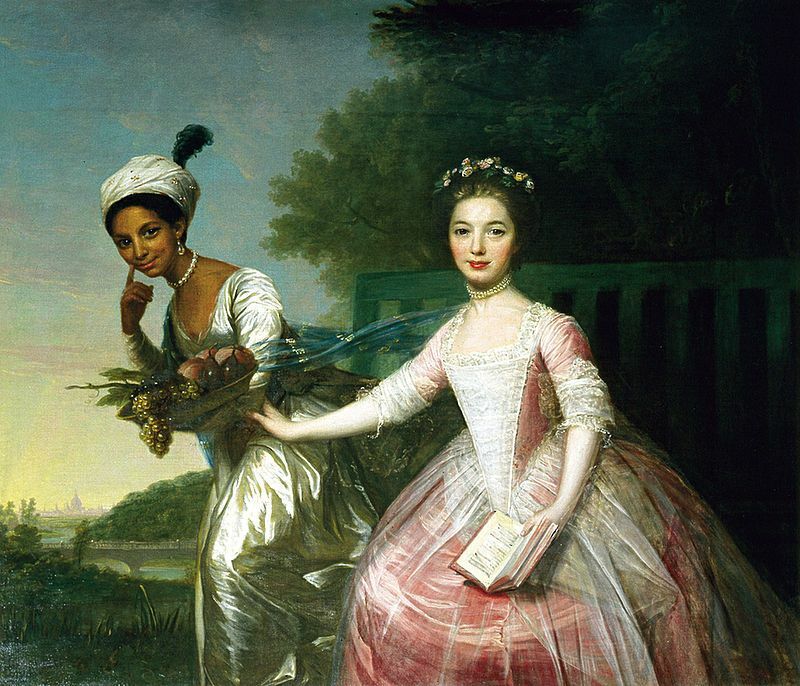 There is a painting held at Scone Palace, the ancestral home of the Murray family that shows two beautiful young ladies, Lady Elizabeth Murray and Dido Elizabeth Belle, in the garden of Kenwood House, with the dome of St Paul’s Cathedral just visible in the background. Formerly attributed to the portraitist Johann Zoffany, it picks up many of the tropes of 18th century femininity and social life. It contrasts the peaches and cream complexion of Elizabeth and the opulent detail of her dress, with the simple ‘natural’ dress and exotic headgear of the mulatto Dido who holds the obligatory fruit. But this portrait does not show the grinning servility of little mulatto boys bearing pineapples or the turbanned otherness of male servants who crowd the corners of other portraits of the time. Instead, Dido is assertive and confident, pointing rather ambiguously to her cheek, and Elizabeth’s hand at her waist suggests companionship and affection. This painting features in the movie Belle, which I saw yesterday in its dying days at the Cinema Nova. I absolutely loved it. The settings and costumes were lush, there was a story line that worked at several levels, and I came out of the theatre saying “What a terrific movie!” instead of feeling underwhelmed, short-changed and wondering if I actually ‘got it’, which is what I often feel these days. Dido and Elizabeth were the great-nieces of William Murray, better known as the first Lord Mansfield, the Chief Justice of England. Born to different nephews, they were both taken into the home of Lord Mansfield, where they were brought up and educated together. Dido, despite her mulatto heritage and illegitimacy, was treated as Elizabeth’s ‘sister’, in itself a controversial decision on the part of Lord Mansfield and his wife. There were limits, of course: Dido did not eat dinner with the family, and her prospects on the marriage market were much different from those of her cousin. As Chief Justice, Lord Mansfield made two landmark decisions which, although narrow in scope and largely leaving the structure of slavery intact, were taken up by later abolitionists and arguably contributed indirectly to the dismantling of slavery in Britain. The first of these was the Somerset case in 1772, where Lord Mansfield ruled that chattel slavery was unsupported by the common law in England and Wales, and that a slave could not be removed from England against his will. The second was the Zong Massacre case in 1783, which was actually an appeal by an insurance company against Mansfield’s earlier ruling over the loss of slave ‘cargo’ when approximately 142 slaves were thrown overboard from the Zong, a slave ship owned by a Liverpool slaving syndicate. The Zong case lies at the heart of this film. I was particularly attracted to this film because of my own research which involves a judge- a nineteenth century one this time- and my interest in the intersection between a man’s abstract principles of law and his private life and experience. Of course, there are infelicities in this film, all in the cause of a good story: Dido was not in fact left a fortune by her father; her place in the household was more ambiguous than that depicted by the film. But the theme of humans, be they slaves or women, as property that can be traded is well-made, and the film does not disguise the narrowness of Lord Mansfield’s decision in the Zong case. You can read more about Dido and the case here. And if it’s still on in a theatre near you, go see it! Update: I’ve found this excellent post on the film Thoughts on Belle on Miranda Kaufmann’s blog. It references a Guardian article that also points out the historical embellishments on the film. This entry was posted in Film and tagged Belle. Bookmark the permalink. It might j-u-s-t be on at the Nova next week. On Friday it was showing in Cinema 14 with the big comfy armchairs and about 30 seats! How do you mean, only 30 seats? It’s a REALLY small cinema!